Jack McMullen, father of Brion P. McMullen (President & CEO of SnoBlox-Snojax), invented the first, clear, polycarbonate snow guard. His first prototype he developed in 1976, which later became known as the Snojax I in 1979. Metal roofing has only been around since the 1980s. Who knew that the injuries and property damage associated with snow falling from metal roofs today would need such an innovative and unique product. As free floating roofs became more popular, Brion and his father recognized a need for a snow guard that could be attached to a metal roof using adhesive, but still be just as effective in keeping snow from sliding off the metal roof. This new idea required a compatibility upgrade from the original Snojax. The first prototype is known as the Icejax, which later became known as the Snojax I. As they continued to develop and perfect this design model, they name changed to Snojax II. With this “original” idea, the Snojax II earned its own U.S. patent for being the first adhesive mounted, polycarbonate snow guard. What made and makes this snow guard / snow stop unique to the industry? This method of attachment eliminates the risk of penetrating the roof’s surface; therefore, avoiding potential roof leaks, seam impairment, panel damage, warranty violation, maintenance issues and call backs. Will not create a corrosive galvanic reaction triggered by dissimilar metals being exposed to various weather conditions. UV stabilized, prime polycarbonate material is approved by NASA and is used to make astronaut face masks. Blend in with the roof, and they are hardly noticeable. Since the year 2000, SnoBlox-SnoJax has developed a variety of snow retention devices and ideas that are widely used today. Year 2000 - “Ace” and “Deuce” – used on metal roofs with minor ribs. Year 2000 - First waffled base designed (enhances the bonding power of the glue). Year 2002 - First patented stack and chimney saver products, the Ventsaver FB 151 and the Ventsaver P-383. 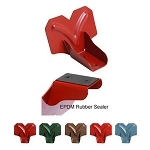 In other words, it is a snow diverter for roof vents and other roof pipe protrusions. Year 2004 – Snobar, Colorbar and Snobar. Snow rail systems that keep the snow from going under or over the snow bar. Year 2005 – Icejax I and Icejax II. Year 2005 – ATI professional testing laboratory tested all the Snoblox-Snojax snow guard / snow stops. The Snojax, SnoBlox and Icejax brand are the strongest snow guards in the industry with the best bonding snow stops on the market. Year 2007 – They opened their product line to qualified resellers like Roof Things LLC. 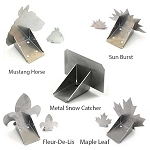 Year 2009 - Decorative SnowCatcher product line released. It include the Mustang, Fleur-De-Lis, Sun Burst and Maple Leaf. These are made with 304 Stainless steel and are offered in 50 colors from the TGIC Polyester powder coat colors. Year 2009 – Released the FIRST recycled snow guard made from 100% post consumer polycarbonate, in other words, the first “green” snow guard. Year 2009 – SlateGuard – It is ideal for retrofit or new construction designs for tile, slate and asphalt shingle roofs. The SlateGuard is used in conjunction with the SnoBlox Deuce. Year 2010 – Released the Roof Clamp. It is intended for use on standing seam metal roofs to attach roof accessory components like satellite dishes, roof walks, conduit or HVAC lines, signs and awning.